joanie mid by Harriet Wilde | Wedding Shoes by Harriet Wilde | Bridal Shoes by Harriet Wilde from Arabesque. 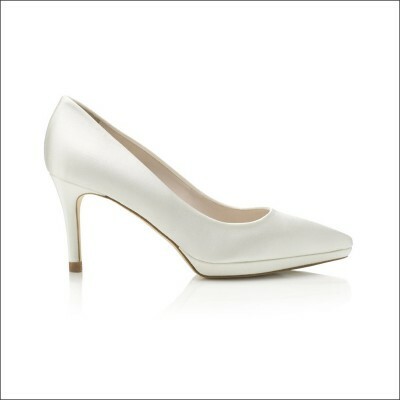 Joanie Mid by Harriet Wilde - contemporary sharp pointed toe court shoe with a lower heel and a mini 1cm platform for long lasting comfort. Joanie looks especially fabulous dyed and with a bespoke metal flower embellishment at the heel. Harriet Wilde shoes are handcrafted from fine italian fabric & leather uppers with pink kid leather linings and natural leather soles ensuring luxury and comfort all day. 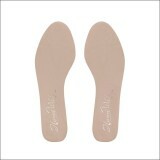 If we are out of stock of this shoe, please allow up to eight weeks for delivery as they are hand-made by artisans. DYEABLE: Yes - it's complimentary on this style!